New competition from Hic Dragones and Digital Periodicals – win a copy of Hauntings: An Anthology plus two of our exclusive penny blood keyrings. A memory, a spectre, a feeling of regret, a sense of déjà vu, ghosts, machines, something you can’t quite put your finger on, a dark double, the long shadow of illness, your past, a nation’s past, your doppelgänger, a place, a song, a half-remembered rhyme, guilt, trauma, doubt, a shape at the corner of your eye, the future, the dead, the undead, the living, a grey cat, a black dog, a ticking clock, someone you used to know, someone you used to be. Rachel Halsall, Brandy Schillace, Allen Ashley, Hannah Kate, Audrey Williams, James Everington, David Webb, Sarah Peploe, Michael Hitchins, Patrick Lacey, Tracy Fahey, Rue Karney, Keris McDonald, Guy Burtenshaw, B.E. Scully, Mark Forshaw, Stewart Pringle, Daisy Black, Mere Joyce, Jeanette Greaves, and Elisabeth Brander. 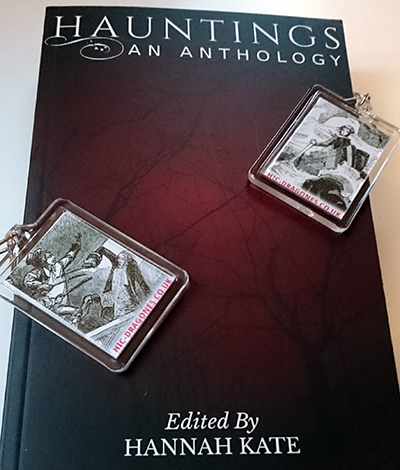 Exclusive Digital Periodicals keyrings feature illustrations from Varney, the Vampyre and Angelina; or, the Mysteries of St Mark’s Abbey.